As I submit this article to The Final Call newspaper for publication, it is also my last day in Detroit, Michigan, having completed the final funeral and burial arrangements for my younger brother who now rests in peace. The city of Detroit is the birthplace of my family and it is the birthplace of the Nation of Islam, founded by Master W. Fard Muhammad, beginning in 1930. I sat secluded in my hotel room overlooking the Detroit River running through both the United States border and Canada on the other side. Thoughts of my early childhood meandered through my mind. I could almost reach out with my hand passing over the river to touch the banks on the other side. I remember being told by the Most Honorable Elijah Muhammad that a photo of one of the planes from the great Mother’s Wheel had appeared in the Toronto or Ottawa Canadian newspaper back in those early years of the founding of the Nation of Islam. 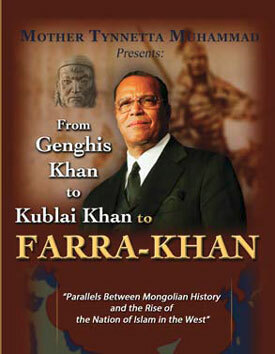 Picture of DVD documentary, “From Genghis Khan to Kublia Khan to Farrakhan” produced by Mother Tynnetta Muhammad covering her extensive studies on the Mongolian Nation and its founder, Genghis Khan, to the present moment of history under the spiritual guidance of the Honorable Minister Louis Farrakhan. I also recalled the young student who introduced himself to me during my senior year in high school, who appeared from another world or galaxy, inviting me to come on board one of these ships, most often identified by the public as UFO’s. On the evening of my arrival to Detroit from Mexico to join my family and other believers in preparation for the funeral rites of my brother, I was told by the sister who escorted me, accompanied by a few brothers from the airport to my hotel, that while they were returning home that evening, they sighted in the night sky at least seven to twelve orange-colored baby planes overhead which hovered briefly and then skirted away out of sight. 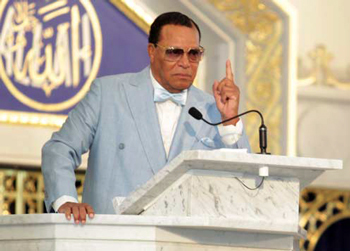 I reflected on the August 17th Sunday address by the Honorable Minister Louis Farrakhan on the subject, ‘The Troubled World—What Should We Be Doing’? delivered from Mosque Maryam in Chicago, Illinois. As he spoke these words concerning Chicago being the epicenter of the worst violence that would break out in America’s cruel and hateful disposition towards our Black population that Ferguson, Missouri, was only a more deepening flashpoint of America’s planned attack against our nation and people, with particular emphasis on our youth. 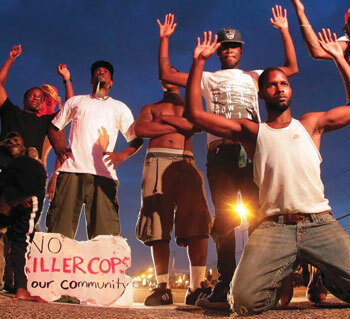 People protest Aug. 17, for Michael Brown, who was killed by a police offi cer in Ferguson, Mo. Minister Farrakhan also reflected on his Vision-like Experience which occurred on the evening of September 17, 1985, 29 years ago in the country of Mexico. In that Vision, he was informed by the Most Honorable Elijah Muhammad that the United States government was planning a war somewhere on our planet which is now targeting our own people right here in America. Mother Khadijah and myself were the first two witnesses to the Honorable Minister Farrakhan’s Vision-like Experience on the morning of September 19th, the day of the great earthquake in Mexico City. I noted that from one border of America facing Canada in the North to her Southern border with Mexico, my journey has taken place including outlets to the sea and the Great Lakes area. I remember the words of the Most Honorable Elijah Muhammad that there is an evacuation plan already established for our escape or departure when the time comes. He referred to climatic conditions and the weather playing a major role in dividing and separating the land mass forcing its occupants to the center of America. The Honorable Minister Louis Farrakhan, as did his teacher, warned us about the rapidly changing climatic conditions that we are facing at the present moment prevailing over America curtailing her on all sides. Many of us were also made aware, through the Divine Teachings of the Most Honorable Elijah Muhammad, that some of us would link up with the angels in helping our people to escape the Divine Chastisement of Allah. As the Honorable Minister Louis Farrakhan ended his address of dire warning with instructions to the Nation and the world on this past Sunday, he described the over-militarization of the police departments throughout America to wage war against its defenseless Black population of X-slaves, and that blood would be running in the gutters. The Most Honorable Elijah Muhammad speaking of these terrible times warned us that we would be attacked in America’s final assault upon our people, but would not take down more than 300 of us before the Help of Allah would come. We may now better understand, with greater clarity, the meaning behind our extensive study in foregoing years on the subject of the Mongolian nation and its founder, Genghis Khan and his followers down to Kublai Khan, who was the last of the Khan’s who resided in China with the proclamation of the Cultural Revolution. This epicenter history comes all the way down to our present time with the Honorable Minister Louis Farrakhan proclaiming the Cultural Revolution and the New World of Islam. May Almighty God Allah continue to bless and strengthen our beloved Minister Louis Farrakhan, and to strengthen our baby Nation of Islam, for the great battle that lies ahead.